Robert Owen is now something of a forgotten figure. Yet this far-sighted visionary, a man who was arguably born before his time, was one of the most original thinkers ever to come out of Wales. He was a socialist long before the term "socialism" had ever been invented. He was also an educationalist par excellence and the man who laid the foundations for the later co-operative movement. Owen was born in the mid Wales town of Newtown on 14 May 1771. He was the sixth of seven children, his father being an ironmonger and saddler, and his mother coming from a long line of well-to-do farmers. A bright and capable child, Robert was schooled at Newtown and then, at the age of 10, was articled to a draper in the town. In due course he moved to London to continue his trade and establish himself in the world. This he managed to do with some alacrity. A move to the sprawling, manufacturing metropolis of Manchester saw Robert Owen installed as manager of Drinkwater's cotton factory in the town. There were greater things to come and on a visit to Scotland he met and fell in love with Caroline Dew, the daughter of David Dale, owner of the New Lanark cotton mill on the Falls of Clyde. 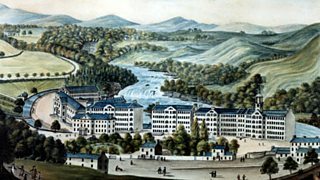 Owen married Caroline in 1799 and with four partners managed to raise enough capital to buy the New Lanark mills off Dale. He was not interested in simply making money, however: Owen wanted to run an enlightened regime at New Lanark. He had over 2,000 people working for him - not just working, many of them lived in the tenement blocks set around the mill. And 500 of these were young children, most of them small enough to crawl under the looms and spinning jennies to clean the machinery and gather in stray cotton or wool. Although his father-in-law David Dale had run a reasonably humane ship, drunkenness, absenteeism and theft, amongst other social problems, were rife. Most of the work force came from the poorer elements of society, from the squalid slums of Glasgow or Edinburgh, and managers expected little else from them. Owen believed he could change this. He wanted to help people but he also knew that better living conditions could only help to make better profits. Soon his aims had become reality. Improved housing conditions - prizes were awarded for things like the best kept room on the block - and a unique system of quality control that let all employees know exactly how they were doing, led to a highly motivated work force. And that was only the start of what he had in mind. Owen soon became a pioneer of nursery or early years education, setting up a schoolroom on the site where children would be educated before they began work in the mill - this, 70 years before formal and compulsory education for all was introduced in Britain. Such a system also provided an early form of child care while the mothers and fathers were working the looms. Visitors to New Lanark today can visit this schoolroom and see for themselves the alphabet of animals that Robert Owen had painted on the walls of the building. Most mills and mines had, for years, employed the truck system where workers were not paid in cash but in tokens that could only be redeemed at the company shop. Consequently, prices were exorbitant and many workers lived below the breadline. Not in Robert Owen's New Lanark. Owen's shop sold goods at little more than their wholesale cost, thus ensuring that families had more than enough to live on. The goods on sale were top quality, unlike the poor pickings offered in many truck shops. By buying in bulk what Owen was able to do was pass on the savings to the customers, his work force. In effect, this was the basis and the beginning of the co-operative movement, something that still works and functions today. Robert Owen wrote extensively about his ideas. He believed, for example, that an ideal community should consist of just over 1,000 people, living in apartments grouped around an open square and with central kitchen and dining facilities. Children, he felt, were best brought up with their families until the age of three and then became the responsibility of the whole community. This was an idea he tried to put into practice at his "ideal" community, New Harmony, in Indiana in the USA. For two years Owen lived in America, trying desperately to make his dream reality. It didn't work, being a concept that was very much before its time. Eventually Owen was forced to return to Britain where other difficulties faced him. 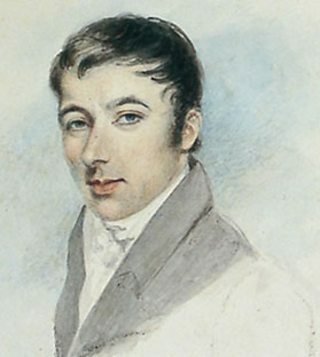 After many disputes with his partners, who were always more interested in profits than in Owen's version of ideal living, he resigned from New Lanark in 1828. He moved to London but the glory days were gone and he was no longer the wealthy capitalist - albeit an enlightened one - that he had been when his work at the mills first began. On a visit to his place of birth and childhood, he was suddenly taken ill and died on 17 November 1858. His dreams of a socialist nirvana never really came to anything; he was clearly before his time. But his legacy, his true legacy, lies in his system of child care and education. And, of course, the concept of a co-operative society where everyone would benefit, not just the men at the top of the tree. Alun Burge has written two articles on the co-operative movement in Wales to coincide with a new BBC Cymru Wales three-part drama called Baker Boys, which begins at 9.30pm, Sunday 23 January on BBC One. Read about the co-operative movement in Wales and the co-operative economy on the Wales History website.